Han Solo: What was your job when you were based here? Han Solo: Sanitation? Then how do you know how to disable the shields? Finn: I don't. I'm just here to get Rey. Han Solo: People are counting on us. The galaxy is counting on us. Finn: Solo, we'll figure it out. We'll use the Force. Han Solo: That's not how the Force works! Finn has some learning to do about the “mystical energy field that controls [his] destiny” over the next couple of movies. I like Star Wars analogies, but won’t be submitting you to any more during this talk. Personal revelation as received through the Holy Ghost forms a rock upon which the church stands, but what does that even mean? “If it invites to do good, it is of God. If it inviteth to do evil, it is of the devil. … And if you are doing the right thing and if you are living the right way, you will know in your heart what the Spirit is saying to you. “You recognize the promptings of the Spirit by the fruits of the Spirit—that which enlighteneth, that which buildeth up, that which is positive and affirmative and uplifting and leads us to better thoughts and better words and better deeds is of the Spirit of God” (Teachings of Gordon B. Hinckley, 260–61). So, the Spirit is not flesh and blood, comes from God, persuades us to do good, and does not invite us to do evil. That’s progress, but still not a something I can really get behind as a definition. How do I know what it sounds like? We get a few more negative definitions here: the Spirit was not in the strong wind, the earthquake, or the fire. However, we also get a positive definition: a still small voice. So the Spirit is a still small voice that entices us to do good. “Occasionally it will press just firmly enough for us to pay heed. But most of the time, if we do not heed the gentle feeling, the Spirit will withdraw and wait until we come seeking and listening and say in our manner and expression, like Samuel of ancient times, ‘Speak [Lord], for thy servant heareth.’ (1 Sam. 3:10. )” (“The Candle of the Lord,” Ensign, Jan. 1983, 53). Let’s look at what we can learn from this story. Samuel lived righteously, so he gave himself the opportunity. He heard a voice and he did not recognize it at first. I note that he got more than one shot here! We want to get so that we can recognize and respond at the first prompting, but the Lord helps us learn and understands. I’ve found this in my own life. I also find Eli’s behavior interesting here. First, the teaching opportunity didn’t come when it was convenient. It didn’t even come when Eli was awake! He also missed it the first couple of times, pretty understandably I would say. But he got it in the end, and helped Samuel along the path to becoming a prophet. Aside from working in the tabernacle and adopting a future prophet, what can we do to help others around us to learn to recognize the Spirit? “You cannot force spiritual things. Such words as compel, coerce, constrain, pressure, demand, do not describe our privileges with the Spirit. You can no more force the Spirit to respond than you can force a bean to sprout, or an egg to hatch before its time. You can create a climate to foster growth, nourish, and protect; but you cannot force or compel: you must await the growth” (Boyd K. Packer, “The Candle of the Lord,” Ensign, Jan. 1983, 53). That patience is extremely difficult, especially for those we love and care for. It might be tempting to use a shortcut and attempt to manipulate people into feeling the Spirit. President Howard W. Hunter offered this counsel: “Let me offer a word of caution. … I think if we are not careful … , we may begin to try to counterfeit the true influence of the Spirit of the Lord by unworthy and manipulative means. I get concerned when it appears that strong emotion or free-flowing tears are equated with the presence of the Spirit. Certainly the Spirit of the Lord can bring strong emotional feelings, including tears, but that outward manifestation ought not to be confused with the presence of the Spirit itself” (The Teachings of Howard W. Hunter, 184). The Spirit of the Lord always edifies. So we cannot force people to feel the Spirit and we should not confuse strong emotions with the Spirit (they’re orthogonal). So what do we do? That makes sense to me as an engineer and scientist. We can do experiments: plant the seed and see how it goes. If we want to help others, help them plant more seeds, and tell them about your experience with planting seeds. I know that I’m feeling the Spirit when I feel edified, when I feel built up. I felt that during my preparation of this talk, [I felt it at points while delivering the talk], and I hope you felt it too. 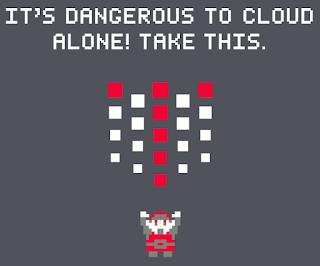 It's dangerous to cloud alone! Take this.